Build a foundation and focus on what matters most for language arts and reading readiness with Language Arts 4 Today: The Common Core Edition for first grade. This 96-page comprehensive supplement contains standards-aligned reproducible activities designed to focus on critical language arts skills and concepts that meet the Common Core State Standards. Each page includes 16 questions to be completed during a four-day period. The exercises are arranged in a continuous spiral so that concepts are repeated weekly. An assessment for the fifth day is provided for evaluating students' understanding of the language arts concepts practiced throughout the week. Also included are a Common Core State Standards alignment matrix and an answer key. Build a foundation and focus on what matters most for language arts and reading readiness with Language Arts 4 Today: The Common Core Edition for second grade. This 96-page comprehensive supplement contains standards-aligned reproducible activities designed to focus on critical language arts skills and concepts that meet the Common Core State Standards. Each page includes 16 questions to be completed during a four-day period. The exercises are arranged in a continuous spiral so that concepts are repeated weekly. An assessment for the fifth day is provided for evaluating students' understanding of the language arts concepts practiced throughout the week. Also included are a Common Core State Standards alignment matrix and an answer key. 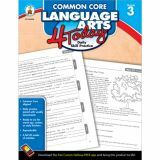 Build a foundation and focus on what matters most for language arts and reading readiness with Language Arts 4 Today: The Common Core Edition for third grade. This 96-page comprehensive supplement contains standards-aligned reproducible activities designed to focus on critical language arts skills and concepts that meet the Common Core State Standards. Each page includes 16 questions to be completed during a four-day period. The exercises are arranged in a continuous spiral so that concepts are repeated weekly. An assessment for the fifth day is provided for evaluating students' understanding of the language arts concepts practiced throughout the week. Also included are a Common Core State Standards alignment matrix and an answer key. Build a foundation and focus on what matters most for language arts and reading readiness with Language Arts 4 Today: The Common Core Edition for Kindergarten. This 96-page comprehensive supplement contains standards-aligned reproducible activities designed to focus on critical language arts skills and concepts that meet the Common Core State Standards. Each page includes 16 problems to be completed during a four-day period. The exercises are arranged in a continuous spiral so that concepts are repeated weekly. An assessment for the fifth day is provided for evaluating students' understanding of the language arts concepts practiced throughout the week. Also included are a Common Core State Standards alignment matrix and an answer key. 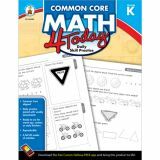 Build a foundation and focus on what matters most for math readiness with Common Core Math 4 Today: Daily Skill Practice for first grade. This 96-page comprehensive supplement contains standards-aligned reproducible activities designed to focus on critical math skills and concepts that meet the Common Core State Standards. Each page includes 16 problems to be completed during a four-day period. The exercises are arranged in a continuous spiral so that concepts are repeated weekly. An assessment for the fifth day is provided for evaluating students' understanding of the math concepts practiced throughout the week. Also included are a Common Core State Standards alignment matrix and an answer key. 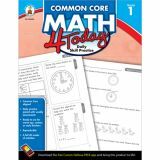 Build a foundation and focus on what matters most for math readiness with Common Core Math 4 Today: Daily Skill Practice for second grade. This 96-page comprehensive supplement contains standards-aligned reproducible activities designed to focus on critical math skills and concepts that meet the Common Core State Standards. Each page includes 16 problems to be completed during a four-day period. The exercises are arranged in a continuous spiral so that concepts are repeated weekly. An assessment for the fifth day is provided for evaluating students' understanding of the math concepts practiced throughout the week. Also included are a Common Core State Standards alignment matrix and an answer key. Build a foundation and focus on what matters most for math readiness with Common Core Math 4 Today: Daily Skill Practice for third grade. This 96-page comprehensive supplement contains standards-aligned reproducible activities designed to focus on critical math skills and concepts that meet the Common Core State Standards. Each page includes 16 problems to be completed during a four-day period. The exercises are arranged in a continuous spiral so that concepts are repeated weekly. An assessment for the fifth day is provided for evaluating students' understanding of the math concepts practiced throughout the week. Also included are a Common Core State Standards alignment matrix and an answer key. 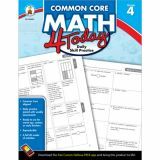 Build a foundation and focus on what matters most for math readiness with Common Core Math 4 Today: Daily Skill Practice for fourth grade. This 96-page comprehensive supplement contains standards-aligned reproducible activities designed to focus on critical math skills and concepts that meet the Common Core State Standards. Each page includes 16 problems to be completed during a four-day period. The exercises are arranged in a continuous spiral so that concepts are repeated weekly. An assessment for the fifth day is provided for evaluating students' understanding of the math concepts practiced throughout the week. Also included are a Common Core State Standards alignment matrix and an answer key. Build a foundation and focus on what matters most for math readiness with Common Core Math 4 Today: Daily Skill Practice for fifth grade. This 96-page comprehensive supplement contains standards-aligned reproducible activities designed to focus on critical math skills and concepts that meet the Common Core State Standards. Each page includes 16 problems to be completed during a four-day period. The exercises are arranged in a continuous spiral so that concepts are repeated weekly. An assessment for the fifth day is provided for evaluating students' understanding of the math concepts practiced throughout the week. Also included are a Common Core State Standards alignment matrix and an answer key.